Zion Market Research has published a new report titled “Household and DIY Hand Tools Market by Product Type (General Purpose Tools, Metal Cutting Tools, Layout and Measuring Tools and Taps and Dies), by Sales channel (Online Sales, Retail Sales and Distributor Sales): Global Industry Perspective, Comprehensive Analysis and Forecast, 2018 - 2024”. 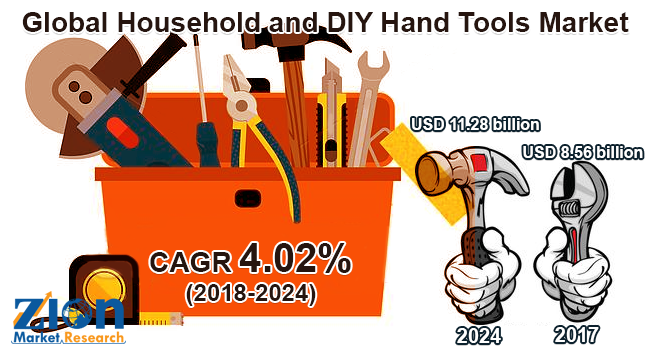 According to the report, global household and DIY hand tools market was valued at approximately USD 8.56 billion in 2017 and is expected to generate revenue of around USD 11.28 billion by the end of 2024, growing at a CAGR of around 4.02% between 2018 and 2024. Asia Pacific region is predicted to grow at the highest CAGR in the global household and DIY hand tools market. The region is likely to continue with its dominance over the forecast period. The regional market growth is attributed due to growing demand for hand tools in the industrial sector across the region. Moreover, the region is a manufacturing hub. The increase in industrial and automation activities is anticipated to further drive market growth in the region over the forecast timeline. North America is expected to have substantial revenue share for household and DIY hand tools market. The regional growth is expected to be driven by the ongoing government initiatives across the region. Government initiatives such as usability tests and live demonstrations conducted in every retail outlet for their proper usage is going to have a positive impact on the regional market. These factors are expected to drive household and DIY hand tools market growth across the globe over the forecast timeframe.